The Saturna Lodge is an historic building that began life in the 1920s as a mill manager's home and, over the decades, has been enlarged and renovated into its present form and use. 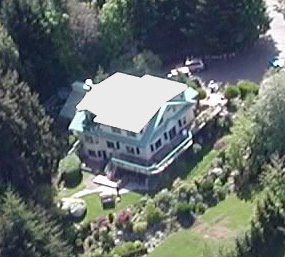 The house is set in a spacious terraced garden overlooking the length of Boot Cove, one of the most protected natural harbours in the Gulf Islands. The Lodge has three levels. Guests enter into the main floor which includes the reception bar, kitchen and Mill House restaurant with large windows offering panoramic garden and water views. French doors lead out to an extensive deck. There are four guest bedrooms on the upper floor. 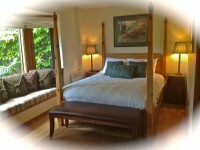 The lower garden level has another three bedrooms and the cozy and relaxing Guest Lounge/Meeting Rm that features a gas fireplace and French doors leading out to the garden. 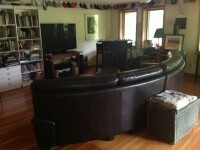 The Lounge offers guests the use of a big screen TV, books, videos and games. It is also the perfect space to hold a special event, meeting or corporate retreat. The garden is an ever-changing palette of colour and form. Many types of plants thrive in the coastal climate and the Lodge garden offers a diverse array; from roses to raspberries, butterfly bushes to bamboo groves, fruit trees to the huge wisteria that threatens to envelop the deck. You will enjoy spending quiet time on a garden bench or swing or, alternately, hone your competitive spirit with a rousing game of bocce on the lawns. Guests will enjoy delicious full breakfasts included in the room rates. Fresh baking and fruit compliments hot entrees that promise to set you up for a day of exploring Saturna. "Wonderful place! Will recommend it to our friends and we will be back." 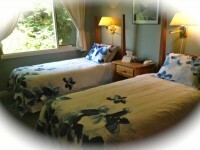 The Saturna Lodge offers seven comfortable, individually-appointed guest rooms. To compliment the local winery and bus, all room names are based on wine, with a twist. 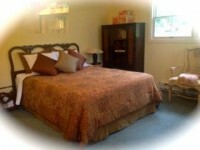 Four rooms are located on the upper level and two on the garden level. 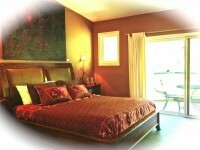 Several of the rooms are decorated with local artist's work that is available for purchase by our guests. Daily guest room housekeeping is available upon request. Barkolo - The room with an extra room. 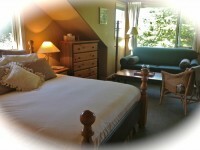 Barkolo is a comfortable garden-level room with queen bed, futon couch and French doors leading to the garden. If an additional bed is required, there is an adjacecent room, Ruffino, with a sofa bed and tempurpedic topper. Just across the hallway, from the rooms, you will find a modern full bathroom and 1/2 bath. Pet friendly (Sleeps 6). Breakfast is included in the room charge and open to Lodge overnight guests. Please let us know if you have any dietary concerns and we will do our best to meet your needs. A fabulous continental breakfast is availble with fresh fruit, yogurt, hardboiled eggs, a fresh baked scone and more. Glueten free options available. The Millhouse Restaurant is introducing a new concept, U-B-Que. We will provide you with light or full meals, use of barbeque w/side burner, full bar service and cleanup. Your pre-ordered items will be delivered with everything you need to make the perfect meal. Chicken, steak, ribs, burgers, seafood, vegetarian and gluten free items will be available. There will be a variety of seasonings to completely customize the flavor of your entrees and side dishes. Instructions, including cooking times, are clearly displayed along with a timer to ensure perfection. U-B-Que will be available to all. 24hr. pre-order will be required to ensure we have all items available. Dinner is available 5:30pm - 8:30pm. Menu coming soon. "The Lodge is a lovely place where peace reigns, the staff are delightful & helpful and it is difficult to leave."